At Rocky Mountain Longhorns, we are extremely excited and proud to add Shadow Jubilee to our program. 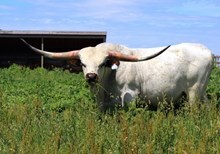 Shadow Jubilee, thought by many to be one of the all time greatest cows in the Texas Longhorn breed. 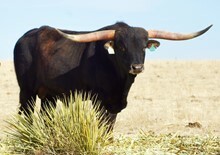 Shadow Jubilee is the second known cow in the Texas Longhorn breed to reach the amazing 90" TTT mark. This amazing cow is continuing to build on her legacy by successfuly producing embryos from the top bulls in the industry.